The Gaelic Grounds in Limerick hosted today’s game. Peter Casey bagged Na Piarsaigh's third goal. IT WAS EVIDENT from the off in this AIB Munster SHC club semi-final that Na Piarsaigh meant business as they sought to put the game to bed as soon as was possible. They had two goal chances inside the opening three minutes, Adrian Breen’s first effort went wide while Declan O’Dwyer pulled off a save to deny Kevin Downes. While the Limerick kingpins were alert from the throw-in, the same could not be said for Clonoulty whose marking was not of the level one would expect for the provincial championship. This in turn opened up a bundle of space for the lively Na Piarsaigh attack and they duly capitalised on it. With twenty one minutes on the clock, Paul Beary’s Na Piarsaigh had built up a 0-10 to 0-3 advantage with the bulk of the scores courtesy of Adrian Breen, Shane Dowling and Ronan Lynch. Paudie White did hit two points from play for the Tipperary champions in the opening half with Timmy Hammersley chipping in with three frees. However the concession of two goals in the final ten minutes of the first half sapped any morale they still had. On the restart, Na Piarsaigh were without Shane Dowling who sustained a hand injury while in the remainder of the half they lost Ronan Lynch and Kieran Kennedy. It still didn’t deter their cause, they scored 1-5 without reply on the resumption with Peter Casey raising his second green flag. Timmy Hammersley kept the Clonoulty-Rossmore account ticking over but the mountain was always too big to climb. All over the pitch, four-time Munster champions Na Piarsaigh dominated. In particular their half-back line of Lynch, William O’Donoghue and Cathal King allowed them stamp their authority on proceedings while up front Breen and Casey scored a combined 2-8. They have yet to lose a game in this competition and it will take a serious challenge to buck this trend. Winning their first county title since 1997 makes 2018 a memorable year for Clonoulty-Rossmore, however their involvement in the Munster club is one they will be keen to forget. Scorers Na Piarsaigh: Peter Casey 2-2, Adrian Breen 0-6, Shane Dowling 0-5 (0-5f), Kevin Downes 1-1 (0-1f), Ronan Lynch 0-3 (0-1f), Thomas Grimes 0-2, Conor Boylan, Alan Dempsey, David Dempsey 0-1 each. Scorers Clonoulty-Rossmore: Timmy Hammersley 0-8 (0-5f), Paudie White 0-2, Cathal Bourke, Conor Hammersley, Dillon Quirke (0-1 sideline cut) 0-1 each. Email “18-point win for Na Piarsaigh as they cruise into Munster final but injury worries over Dowling and Lynch”. 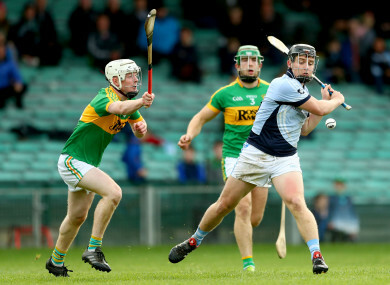 Feedback on “18-point win for Na Piarsaigh as they cruise into Munster final but injury worries over Dowling and Lynch”.